No chemicals—100% free of aluminum, parabens, phthalates, and gluten. “We heard that natural deodorants never work, so we fixed that. Schmidt’s sets new standards for deodorant: a luxurious feel, health-conscious formulation, captivating scents, and an experience that can outlast the competition. Founder Jamie Schmidt had a passion for natural body care products, and became motivated to make natural products for her family’s health during her pregnancy. I have tried many natural deodorants and none of them ever worked for me. I learned about Schmidt’s at Natural Products ExpoWest, one of the biggest conventions in the country. I have been using Schmidt’s ever since. The best part is, it doesn’t stain your clothes or create pit stains—those actually come from the chemicals in deodorant, not from you. Since the product is coconut-oil based, it works best gently warmed before applying. A little goes a long way; I use about half as much as regular antiperspirant. 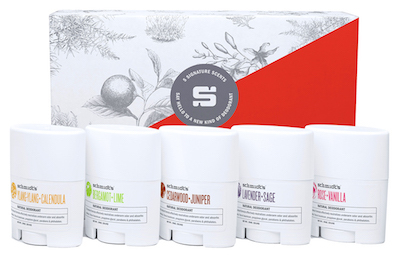 Online at Schmidts Deodorant, check their store locator for a store near you. Required FTC disclosure: The giveaway items were provided by Schmidt’s Deodorant. I was not paid to write this post.